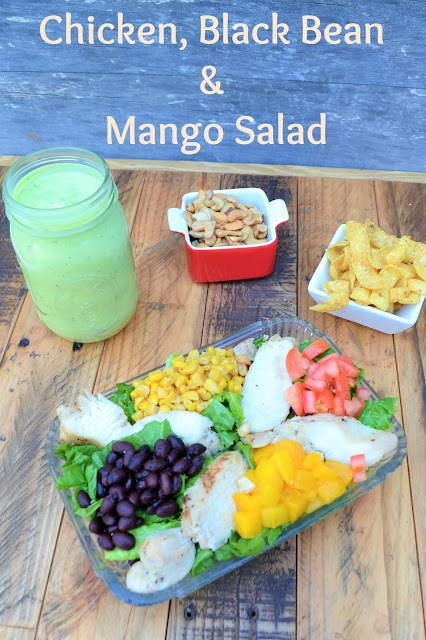 This Chicken, Black Bean, and Mango Salad is not only colorful, it is chock full of flavor that and so scrumptious, you'll be making this all summer long. Grill some extra chicken at your next bbq or just cube up a store bought rotisserie chicken, for this easy to pull together meal. I like to pair it with my Avocado Ranch Dressing, and pretty much have this salad every other week at least! Seriously, don't leave off the cashews or corn chips either, they make the salad.. just, just.. perfecto! A colorful salad that is just bursting with flavors and textures that will make this meal an adventure to remember. Lay the Salad greens on a platter or individual plates.On top of the greens, place beans, mango, corn, tomato, bell pepper, and avocado.Sprinkle on the chicken,green onions, cashews, and corn chips. top with dressing and serve. This looks like my kind of salad! So full of flavor and goodness!